One of the questions hanging over the computation of the 2017 UEFA coefficients has been how they would affect the 2018-9 qualifying, given that major changes are coming to the Champions League, and by extension, the Europa League. For 2017-8, entry is determined by the 2016 coefficients. There is a table put together by the indispensable Bert Kassies that shows what happens to a nation's teams at various rankings. In the range of realistic interest for Scotland, countries 13-15 are equivalent, 16 and 17 are, 18-24 are, and 25 down to 45 are. If your coefficient drops from 17 to 18, your national cup winner enters in the second round rather than the third, and your second-place team enters in the first round. This month, UEFA approved the new access list for 2018/9 qualifying. Unfortunately, they then neglected to release it. So it fell to Kassies to piece it together from publicly-available information and leaks on his message board. Based on his list, the breakpoints are in the same places. So, how does this affect Scotland? For 2018/9, not much. If the Cypriot and Bulgarian teams both have amazing runs through the Europa League knockout phase, Scotland could conceivably be knocked down to 25th again. But that is very unlikely. From 2019 onward, aside from avoiding that 24th/25th drop, now a climb to 17th is even more important, as it spares the national champions one extra round of qualifying. Unfortunately, they would have to make up almost 5 points on Denmark in next year's competitions (as well as lesser amounts on other teams) to get up there. For 2020, however, they need less than 4 points on Austria -- and they have two years to do it. Two years of solid performances by Celtic and Rangers could have them within striking distance. 2021? Well, by that point, the rules will most likely change again. Geocaching, particularly with the aim of generating particular statistics, is a bit of a strategy game, and like any game, it's best when you can make moves that fulfill more than one goal at the same time. One stat that always jumps out at me is the "maximum distance in a day." I enjoy seeing this because it reminds me of a day on my most-recent cross-country road trip. And yet, it seems silly that with all the flying I've done, I haven't managed to get more miles than that in one day. It's actually hard to coordinate with flying, because if you have an early flight, or a late flight, it's hard to cache on both ends. Overnight flights kill this, and time zone changes can leave you with a short day. But I had a trip to Ottawa planned for late afternoon, so I figured I could bump this up (flight miles from Dulles to Ottawa: 451). I first found a cache in Reston before my flight. That cache gave me my first November 2015 cache, filling another month in that grid -- Month 122. Unfortunately, when I got to the airport, my flight had been canceled. It was rescheduled for too early the next morning for me to cache both ends, and my return flight was a late flight, dashing my hopes of updating this statistic. 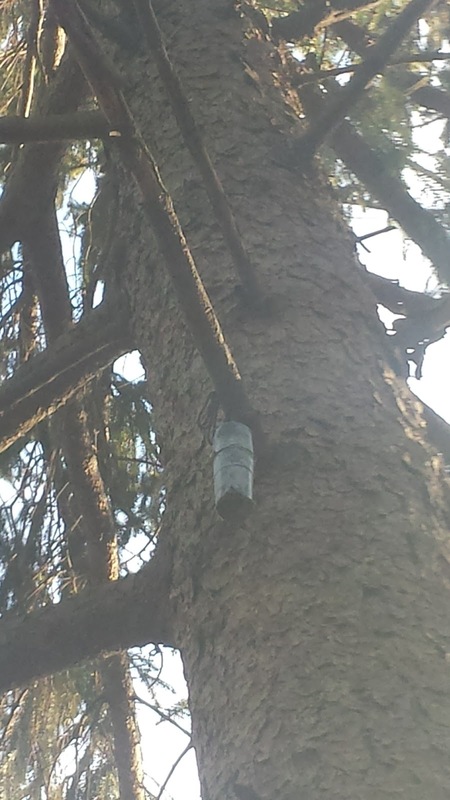 I still had plans for finding Canadian caches, and the next day gave me an unexpected opportunity to set a different personal record. My flight circled the Ottawa airport before diverting to Burlington, Vermont. The airline gave us a choice of returning to Dulles or renting a car and driving to Ottawa. On to Ottawa! My colleague and travel companion "Bill" indulged me by stopping for a cache before we left Vermont. 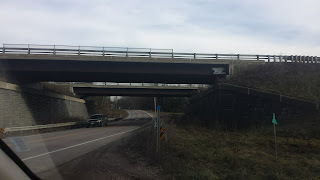 He was underwhelmed by the cache's location (in a guard rail near a highway underpass), but my statistics were updated. That gave me my 12th state, and my 30th county (Franklin County). The cache was also the first one I found placed in July of this year -- Month 123. Additional payoff came on the other end. 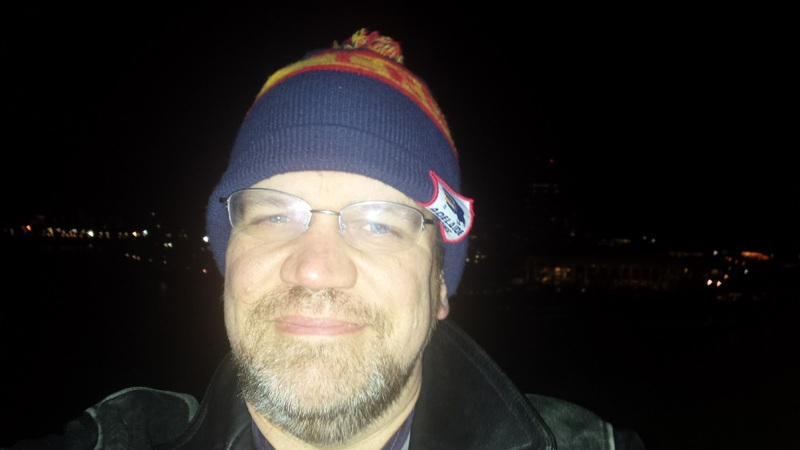 It was a cold, wet Ottawa night, but there was a park down the block from my hotel with a cache. That was my first Ontario cache, and allowed me to break my record of most countries in a day (previously, it listed the day I started geocaching as my record day). I had another cache in my sights for Ottawa, though. Fortunately, I did not have to walk all the way out to it that night in the cold, but I headed there the next night. It was a virtual cache, the first I had found in Canada. 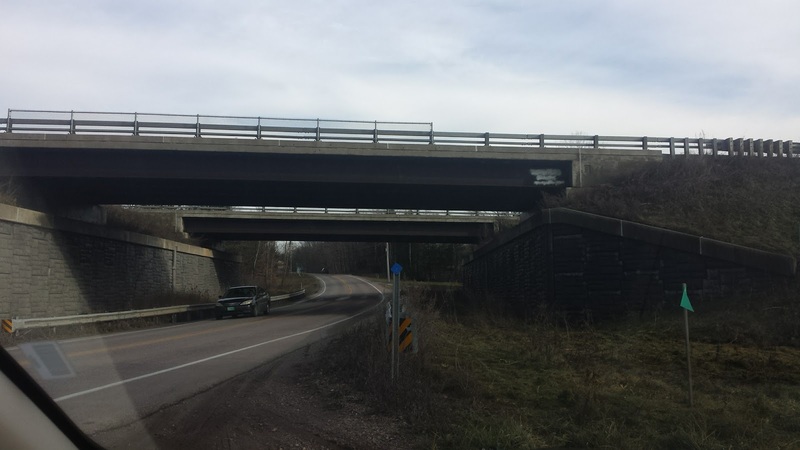 It was too cold to walk across the bridge to find my first Quebec cache, however. At the virtual cache, with the lights of Quebec in the distance. What did that do for me? Well, upon return to the US, I was now allowed to claim a find for a challenge cache that requires the finder to have found virtual caches in six countries. Took a while to make it from five to six, didn't it? 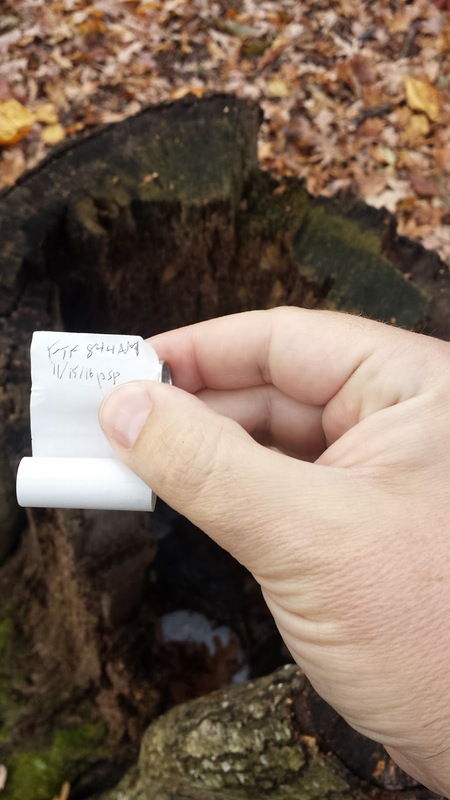 That was also my first find in Falls Church (County 31), my first find from June 2014 (Month 124), and my first Difficulty 5, Terrain 3.5 cache (Combo 26) -- the D/T ratings for challenge caches are somewhat subjectively based on the difficulty of completing the challenge. 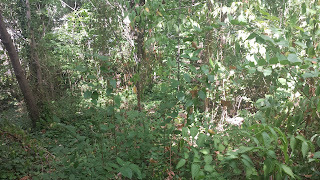 While I was in the area, I found another challenge cache that required me to find caches 25 degrees of longitude apart. Estonia to California is 144, so I am way overqualified. 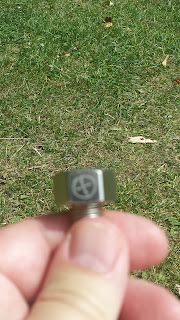 That was my first Arlington cache (County 32), and my first D/T 2.5/2.5 cache (Combo 27). There was another challenge cache nearby that would give me a 3/3 combo, but my phone was not getting data from the network, so I had to head back. 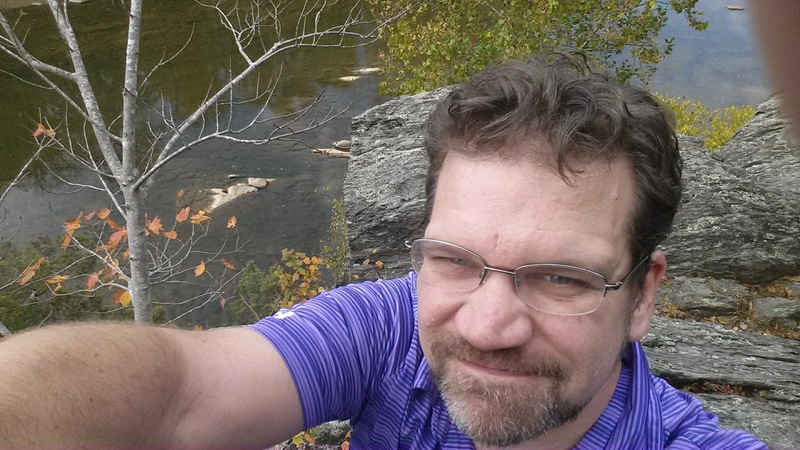 I looked up a D/T 1.5/3 cache in Reston that would give me Combo 28, but when I got there, the cache turned out to be about 12 feet up a tree -- and I'm not a climber. But with all the challenge progress I had made lately, I didn't feel too bad. Well, the group stage is over, and for Scotland, there's no knockout stage to preview. Scotland is now ranked 23rd for 2017 -- where they started and spent most of the competition. They took 22nd briefly after overtaking Norway, but they were in turn overtaken by Israel at the end of the group stage. It helps to have teams in the Europa League! The games there are much more winnable -- by contrast, all 16 teams left in the Champions League are from the top six leagues. Somehow Legia Warsaw did well enough in the Champions League to fall to Europa League knockout, so while it looked like Scotland had a chance of catching Poland on the strength of three draws, Poland is itself moving up. Could Scotland fall further? The only two teams below it still alive are from Cyprus and Bulgaria. If Apoel Nicosia wins both legs in the round of 32 against Ajax (seems unlikely), that would push Cyprus past Scotland. Bulgaria, by contrast would need to see Ludogorets make at least the quarter-final to move ahead. So it's most likely 23rd, but we'll keep an eye on it. We'll also keep an eye on what it means, as UEFA is supposed to announce this month the qualification procedures for the 2018-19 Champions League and Europa League, which is where this coefficient will matter. Beyond that, Scotland starts next year in 24th for the 2018 coefficient (again, subject to the fortunes of teams from countries behind them), but things are much more bunched up. Hopefully by the time qualifying starts, we'll have a better idea of how the ranking will matter. In the Scottish Premiership, things are shaping up well. Celtic is running away with the title (and the Champions League place). Since they're the only club with a chance of competing, that's good for the coefficient. Rangers may have the resources to make a run in the Europa League; I'd like to see that. Aberdeen has contributed 2.375 of that coefficient over the past three years, so they are a healthy third choice. The fourth place depends on Scottish Cup outcomes, but Hearts is probably the best-placed if the Cup goes to one of the top 3. Thank you for coming to my father’s memorial service. Believe me, he would not have wanted to go to yours. He would have loved to share a meal with you before your passing (as long as there weren’t too many people there), but he was not much for funerals. I learned a lot from listening to my father over the years. When I was 11, my Great Aunt Mannie passed away. Perhaps picking up on my father’s reluctance, I didn't go to Pennsylvania for the funeral. When my father got back, he told me I should have gone -- it was interesting listening to older relatives, particularly the one who ranted about my father’s job, because he confused National Security with Social Security. I learned from my father that it’s meaningful to be at services like this, even if you would rather avoid them. That’s the thing about my father -- he didn’t say much, but what he said was always worth listening to, and remembering. My father very rarely got angry with me, but I remember one or two times. When L. Ron Hubbard died, I was disappointed to learn that Scientology wasn’t just a big practical joke. He responded strongly and told me that while I might not share someone’s beliefs, those beliefs were sincere and not to be made sport of. My father had a lot of empathy. One time when I came out here to visit him, he surprised me by mentioning something he had heard on Rush Limbaugh’s show. Those of you who knew my father’s politics know that he did not share a lot of opinions with Rush. I asked my father why he was listening, and he told me, “For the same reason we used to listen to the Russians -- because we need to know what they’re up to.” Some people listen to their political opponents to get worked up, but my father was genuinely curious where the other side was coming from. I could really use some of his empathy this week. Sometimes I learned from his actions rather than his words. When I was 12, I took math classes on Sunday afternoons at Johns Hopkins. My father was a big football fan and accustomed to spending Sunday afternoons in front of the TV, but taking me to class was not an inconvenience. He simply bought a portable TV. I am a very different type of father than my dad -- I changed more diapers that first week than he did in a lifetime -- but the lesson I learned was that your children's needs are not inconveniences, but rather joys to be embraced. I’d like to conclude with part of an e-mail my dad sent after my grandmother -- his mother -- died. Celtic just won their 100th major trophy by picking up this year's Scottish League Cup. I was surprised the number was so low. Let's ignore the European trophies for the rest of this post (only 1 of the 100 falls into that category). Every year, there are three major trophies in Scottish football -- the league, the Cup and the League Cup -- I figured Celtic would have averaged about one a year over their history, which stretches back well over a hundred years. My primary error appears to have been forgetting that the Scottish League Cup only dates back to the 1940s. That got me thinking, how does my trophies/year guess look for Celtic in the post-war years? And what is the rate for other clubs? One of the amazing things about Scottish football is the long history, and the fact that Rangers and Celtic have dominated it for pretty much the entire time. On the other hand, if you look at the full sweep of history, you see weird things like the fact that Queen's Park is tied for 5th on the list of major trophies, despite not having won anything since 1893. So let's call the post-war years the modern era. There have been 71 League Cups, as well as 70 each of top-flight titles and Scottish Cups since the War. All together 211 trophies on offer. Rangers picked up 80, Celtic 65 and everyone else 66. So a trophy per year is pretty close for Celtic, and only a bit low for Rangers. A trophy a year is also pretty close for the category of everyone else. 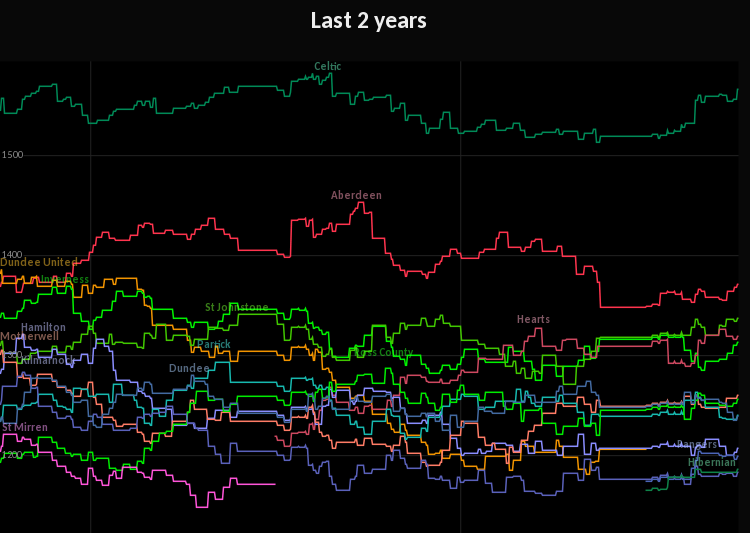 Breaking down the "other" category further, Aberdeen has 17 trophies, Hearts 10, and Hibs 7. So the totals are 38% Rangers, 31% Celtic, 16% Next Three, 15% Small Clubs. I'm going to use these stats to bolster my contention that the five biggest sides in Scotland are the ones with the resources to pull Scottish fortunes up in Europe. With Celtic not going any further in European play this year, I'm keeping my eye on who Scotland sends next year. The top four on the table look pretty good now, but a weird victor in the Scottish Cup could mean a lesser club competes. Of the big five, the two Edinburgh clubs are probably the least promising right now. Hibs is still second-tier, and though they look to pull themselves up, their experience this year with Europa League play doesn't bode well if they repeat as Cup champions. Hearts seems to be a solidly-run club, but part of that is that they are investing in their stadium rather than chasing players. Also, their manager may be lured away. So I think we can say that in order to make a push, Scotland needs to send its big two clubs to Europe, and it would really help if one of the other was Aberdeen. Last month, I found my eighth geocache type when I found my first webcam cache. 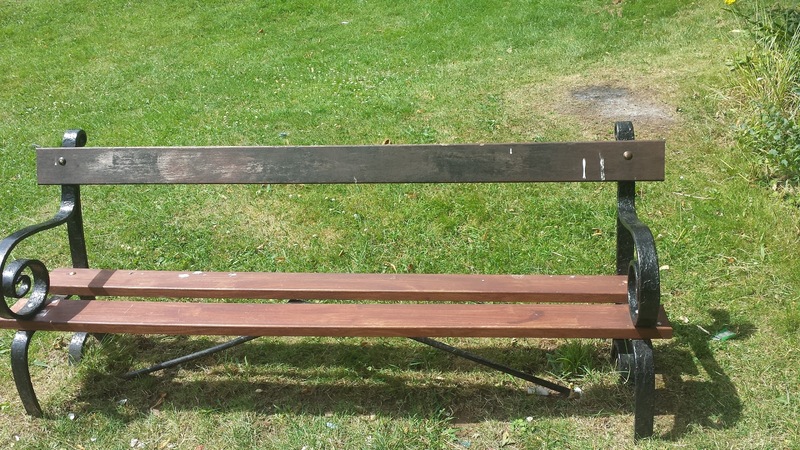 This month, I went for number nine, and the last of the main cache types: the Letterbox. 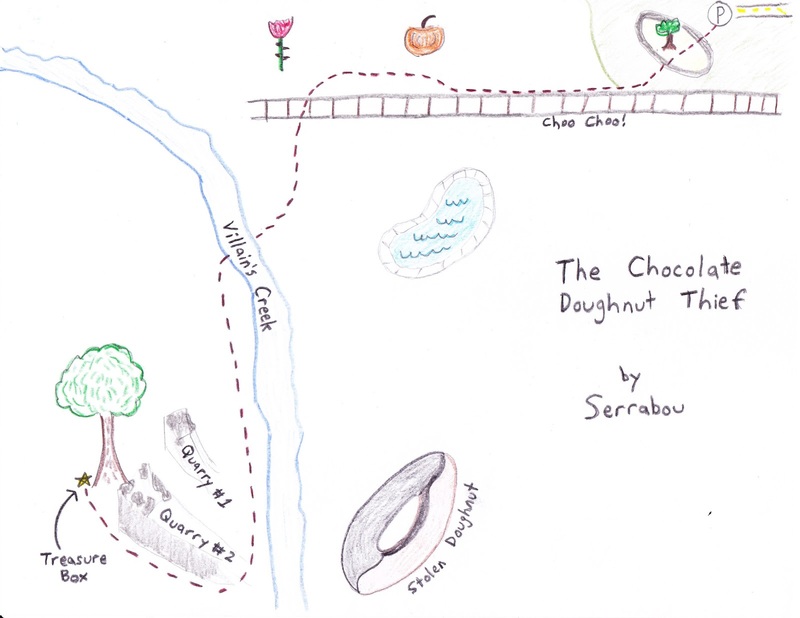 Letterboxing is similar to geocaching, but its origins date back to the 19th century. 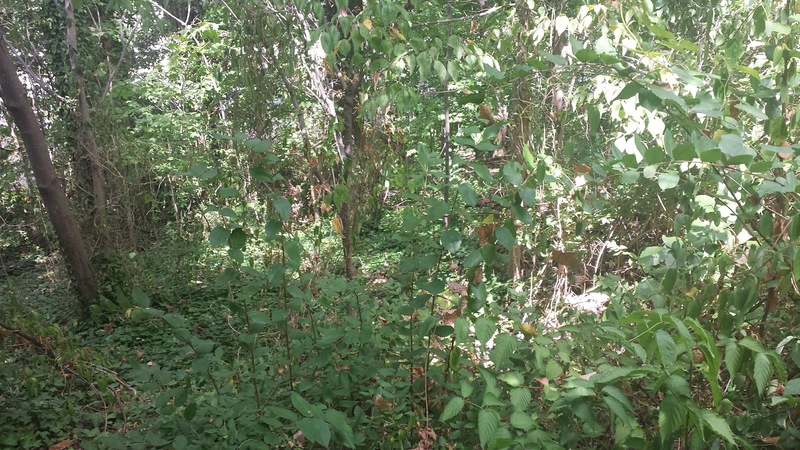 Instead of GPS coordinates, finders use maps or directions to locate the hidden containers. It grew in popularity with the advent of the Internet, and Geocaching's parent company made a failed bid to become the official home for letterboxing. The aftermath of that, however, left us with letterbox hybrid caches, which combine elements of both types of location games. I parked at the parking location, and guessed which direction to head off in. Reading a note the cache owner had posted led me to the fact that the flower and pumpkin at the top of the map represented certain streets, so I felt good when I realized I was near those streets. 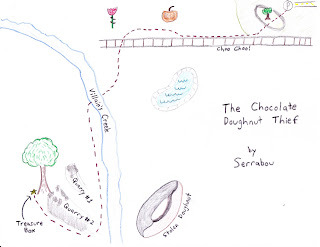 I guessed which trail would lead to the creek, and seeing that the hider had put coordinates for the doughnut (Hint: "Map is not to scale; if you walk past the doughnut you went too far") further convinced me I was on the right track. That was confirmed when I found a creek to cross, and two things that looked like quarries, with a big tree at the back of one of them. I was amazed, but I had finally found a letterbox. I am not as enamored with the "puzzle" aspect of geocaching as others are, so I don't think I'll be doing many more letterboxes, unless I find some that are relatively straightforward. There are some milestones I passed which didn't seem to merit their own posts, but I thought I'd capture here. 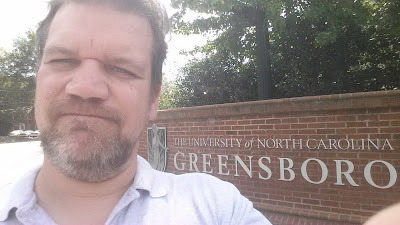 The letterbox cache was my first cache in Fairfax City. In Virginia, cities are entities independent of any county, so they count as counties in the overall total. That's County 29. I got my fourth FTF ("First to Find") on a cache published this month. 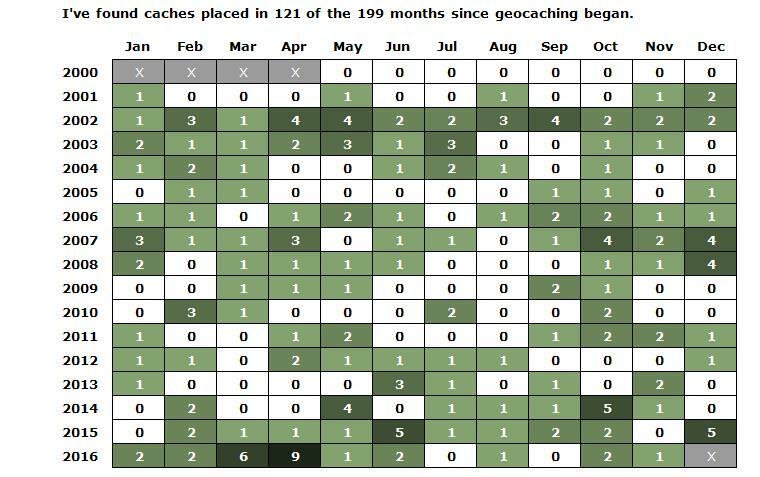 I have now found caches placed in 121 different months, leaving 78. Last month I had 90 left to go, so I'm chipping away at that challenge. 2015 now joins 2006 and 2007 as years where I'm only missing two months. The progress in months has included knocking out two months from 2001, January and November. The January cache is the oldest I've found yet. I added three more difficulty/terrain combinations. Podcache was a tricky one, so I really felt like I was expanding my geocaching skills. The next one was a "challenge cache" that you could only log if you had found caches 25 degrees of latitude apart (Estonia to Puerto Rico is 41). Some challenge cache hiders make the rating based on the challenge itself, so I will probably find more combos that way soon. Carderock was a nice virtual cache that involved clambering up a rock overlooking the Potomac. 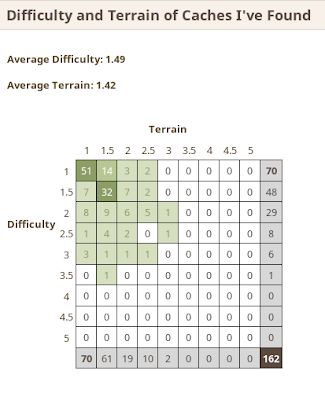 My ranking in difficulty/terrain averages among those with at least 100 finds is 7471/7544. At least 73 from the bottom is better than 16 from the bottom, where I was in September. I had my busiest week ever last week, when I found 10 caches. Previously my busiest week included the day I went into DC and found 7 virtual caches (still my busiest day), but with the help of a 6-cache day last Monday, I set a new weekly record. 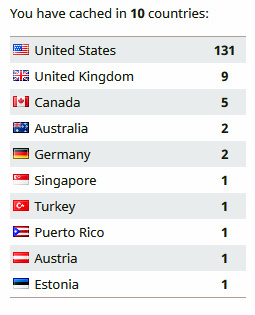 Given that I have seen stats where people find over 1000 caches in a day, that's not much, but it's a record for me. 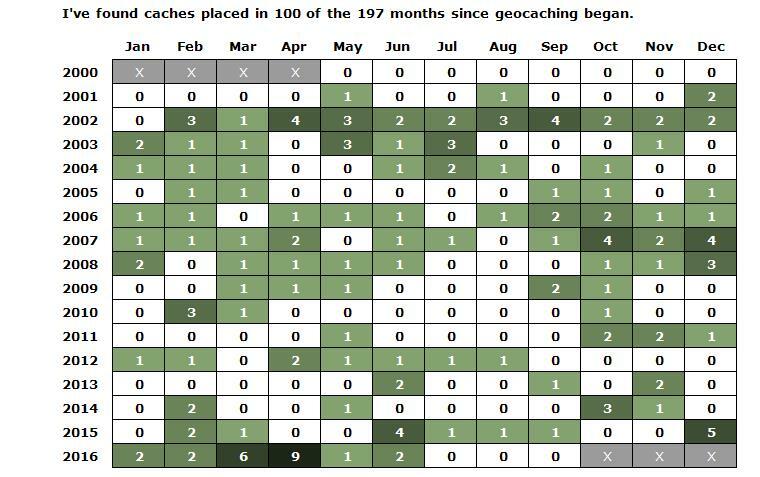 On the geocaching web site, you can search for nine different types of caches. There are other, rarer types, but I think they are considered subtypes for search purposes. Here they are with the total number of caches available worldwide as of Saturday, October 29, 2016. Of these, Virtuals and Webcams are "grandfathered", meaning that it is no longer possible to create new ones, and it has not been for more than a decade. Since I last counted virtuals a month ago, six have gone away. By far the rarest type is the webcam cache. The idea is to go to a location where a webcam is filming and capture an image of yourself on camera. This was a lot more difficult back when the caches were active, since nobody had phones that could grab the image! You would have to call a friend to get them to nab the image, or you would have to set up a script on your home computer to save the image. 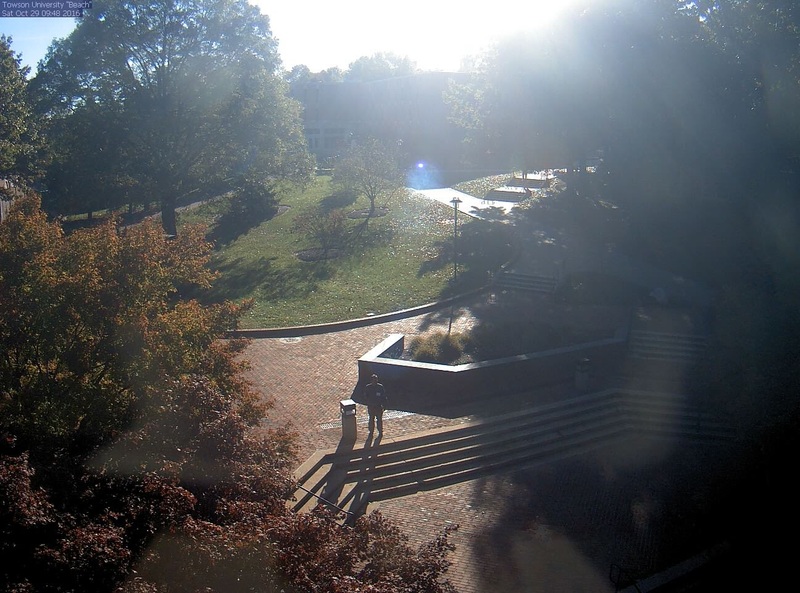 When I learned I would be giving a talk at a conference at Towson University, home of one of 130 remaining webcams in the United States, I knew I wanted to find it. I got to the conference early, made sure everything was set up for my talk, and then ran out and grabbed the image. 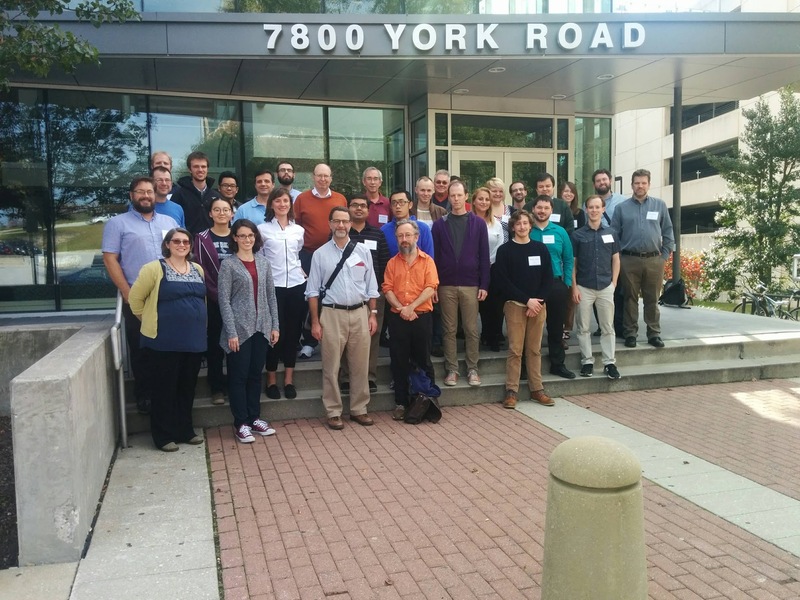 It's not a very high-resolution picture, but you can see (but not read) my conference badge. So that leaves one of the main types of caches for me to find -- the letterbox. They aren't as rare, but they are still a little bit unusual. That's a story for another day, however. I didn't want to let six matchdays go by without checking in, so here's where we are halfway through the group stage of the Champions League (and for other nations, the Europa League). So Celtic managed to grab a draw against Manchester City. That added 0.25 to the coefficient, which moved Scotland past Norway into 22nd. Yay! No more 23rd (for now), where they had been stuck the entire time. Legia Warsaw is having an even worse time in the Champions League than Celtic, so Poland is still within striking distance, if Celtic can put together a win or two draws in their last three matches. On the other hand, Israel's coefficient has inched up 1.25, Azerbaijan is up 0.75 and Cyprus is up by 1. A repeat of that performance in the last three matches by Israeli clubs, a surge by Azerbaijan, or qualification for the knockout stages by APOEL Nicosia could move any of those nations past Scotland. It just goes to show that having two teams do reasonably well in the Europa League is better for the coefficient than having one do poorly in the Champions League. I'm not sure that's fair, but that's how it is. In December, UEFA is supposed to unveil the new qualifying procedure, which will take place the year after next. The coefficient referenced above is the one that will get used in this qualifying, so these moves of one or two spots could make a big difference...or no difference at all. I will update when we find out. 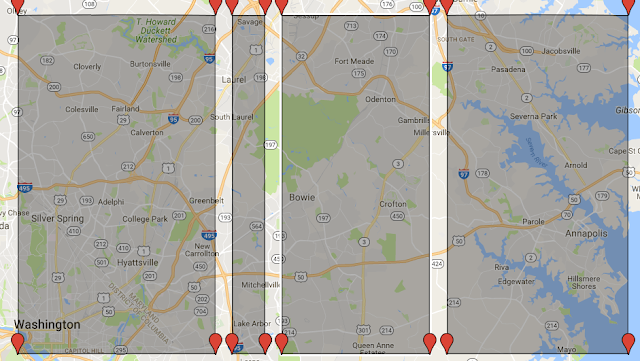 On Friday, I found a virtual cache in Virginia that was placed in January 2002. Not only did this bring me one month closer to finding a geocache placed in every month since geocaching started (the Jasmer challenge), for the first time there's a year where I've found a cache placed in every month. Why 2002? 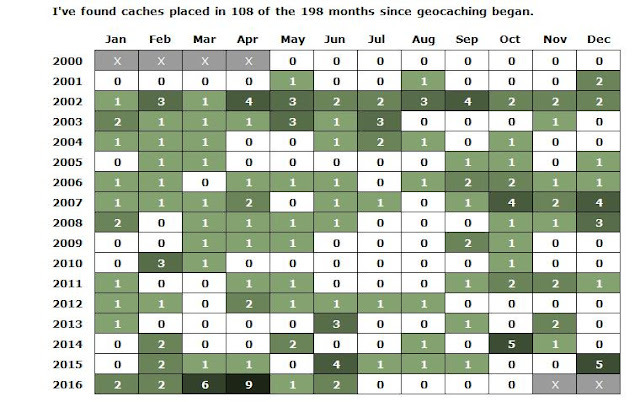 Well, 2000 and 2001 were really early days of geocaching, and there aren't a ton of caches left from then. I have actually found four caches from 2001, but none from 2000 yet. The other reason is that new "virtual caches" were banned about 11 years ago. Since there is no container to maintain, they tend to stick around, and they can be fun to find. Currently, there are 4,642 virtuals remaining, only seven of which date from after 2005. I think those seven are weird cases where the placement date has been changed over the years. In fact, I found a virtual cache placed in every month from 2002. 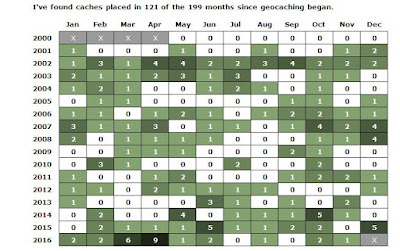 Of the 29 caches from 2002, 25 were virtual and 4 were traditional. Of the four traditionals, two are no longer available. Of the 25 virtuals, two are no longer available. How do virtuals go away, since there's no container to maintain? Well, generally you need to e-mail your answer to the cache owner, and if the e-mail address no longer works, the geocaching reviewers will archive the cache. 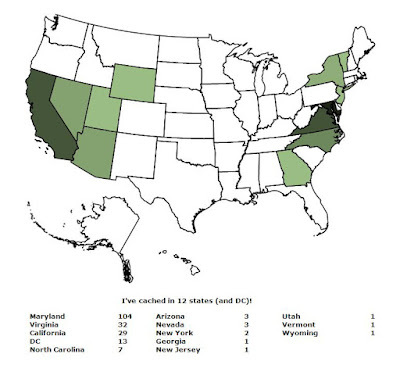 Looking at the list of 29 caches, I have found them in Virginia, California, England, New York, New Jersey, Nevada, Germany, Maryland, Turkey, Georgia, DC, and Arizona, so geocaching had definitely spread far and wide by 2002. So now I'm up to 108 months found, out of 198. Perhaps I should count down by saying I have 90 left to find, since the total number of months keeps going up. I'm only missing 2 months from each of 2006 and 2007 -- most of those I did when I started caching in 2007 and early 2008. So those may be the next years I finish. Also, that January 2002 cache is now the fifth oldest I've found. So I definitely tend towards the easier caches. I've talked in the past about finding new D/T combos to fill out this matrix, but I haven't made any progress there since April. Hard geocaches are, well, hard, and I haven't had a ton of time to seek out the more adventurous ones lately. But let's focus on something else -- the average. As you can see above, my average cache isn't too far off a 1.5/1.5 cache. (For reference, that's the hardest cache that can be found with the official Geocaching app if you don't spring for a premium membership.) In my last post, I looked at what percentile I am in terms of number of counties. What percentile am I in difficulty and terrain? (Keeping in mind that the people I'm comparing with have necessarily had to pay for premium in order to generate the stats. Well, my average difficulty puts me 8019/8048, or the 0.36th percentile. My average terrain puts me 7991/8048, or the 0.7th percentile. Wow -- I think there'd at least be enough geocachers in wheelchairs to bump me higher than that. Combined, and restricting to those who have found at least 100 caches, 7865/7881, or the 0.2nd percentile. That's pretty bad! And with things like cache rate, where I can say that I'm unusual in that I've kept at it over the years without being obsessed by it, that's one thing. But this just indicates that I'm not particularly good at it! So, certainly, 3.0 caches are findable. If I brought my average ever-so-slightly up to that, I would be up to the 0.64th percentile, which is slightly less embarrassing. 3.5 is also doable, and it would bring me all the way up to the 51st percentile -- slightly better than the median cacher. So, clearly, most cachers are between 3.0 and 3.5. If I make it a point to favor caches with a combined rating of 3.5 and above, I can certainly bring up my average (and track it here). After adding a new Arizona county last month, I added two more counties on our trip to California. The next day, we went to see friends in LA County. On one of the many bathroom stops on the way home, I found another one outside a Starbucks. Well, despite the fact it was almost identical to the one I found in my parents' retirement community, Christina found it for me. So that's now 4 counties in California. That's still 54 I haven't found. Maybe three of those are within a couple hours of a future trip to San Diego, but the rest would wait for trips to other parts of California. Still, I enjoy seeing the map changing. 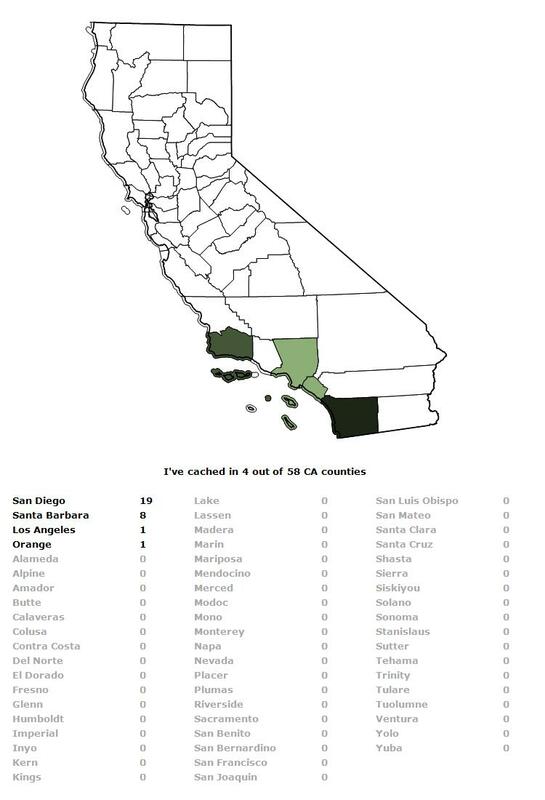 California is only one of three states (with Maryland and Arizona) that I've actually caches in multiple counties. But I still enjoy the maps! 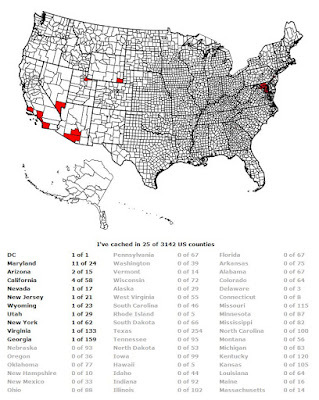 Finding caches in all the counties in any one state is already probably going to be too much for me, so why keep track of progress towards America's 3142 counties? 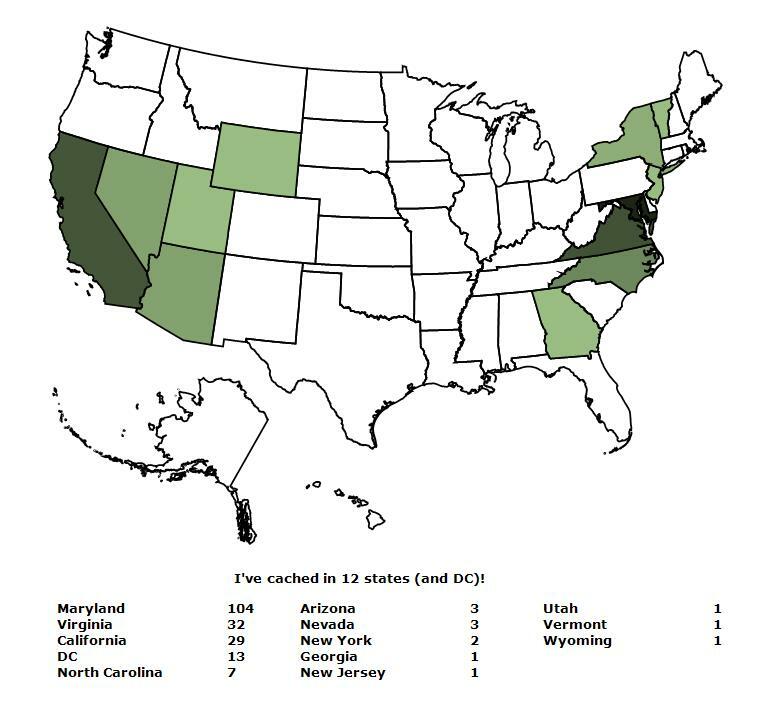 Well, it's easier to make incremental progress, even when visiting new states. Also, finding all 3142 counties is tricky for anyone. I recently heard a podcast mention someone who had that as a goal (along with his son). He stated that nobody had even visited all of the county-equivalents in Alaska, let alone the U.S. According to My Geocaching Profile, the top county finder is at 2703. The guy is at #16 on the list, but looking at his map, I have hit 14 counties he hasn't so...counties are really difficult I guess. Well, Celtic qualified for the Champions League, but everything about it was ugly. They let their opponent score 2 goals in the first leg, and then got shut out in the second leg. The one win netted 1 point (and 0.25 for the coefficient), and more importantly 4 points (and 1 for the coefficient) for qualifying for the Champions League. Celtic face FC Barcelona, Manchester City and Borussia Mönchengladbach. Let's see, sides that finished in the top four in the top three leagues in Europe (and let's face it, the world). That can't be good. A good result would be a third-place finish in the group, while netting 4 points (and 1 for the coefficient). That would be two wins, four draws, or a win and two draws, i.e., a third of what is available in the six matches. But honestly, that looks like it would take a miracle at this point. Still, third would get them into the knockout phase of the Europa League, and they could actually pick up more points. A bad result would be six losses. 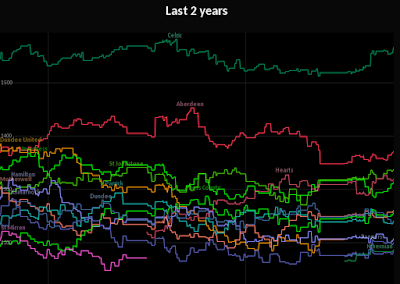 That is more likely than third place right now. Still in 23rd? Seriously? I was not expecting them to stay in 23rd the whole time I was tracking this. Fortunately, three of the four teams ahead of them are out of European competition, so by putting together some super-miracle and qualifying for the knock-out phase of the Champions League, Celtic could vault Scotland up at least three notches. Probably four, given Legia Warsaw is unlikely to do the same for Poland. More realistically, any sort of result (i.e. even one draw) will pull them past Norway. UEFA is supposed to announce changes tomorrow which would see the top 4 leagues get their top 4 teams directly into the Champions League group stage. It's not clear how that's going to be done, but it will certainly make it harder for everyone else (including Scottish teams) to get there. My analysis of the UEFA coefficient has been based on the assumption that the same rules would apply in future years. But the coefficient I'm following above impacts the 2017/8 season, which is when the new format would start. Right now, countries ranked 19-28 are treated exactly the same, and major changes only happen when you move up to 15, when the runner-up gets in the Champions League. So the goal was to get Scotland up to 15. It's possible that the coefficient will be more important, particularly if 19-28 are no longer treated the same. Maybe (for example), 23 and below will have to enter in an expanded first round. Or it's possible that the coefficient will be less important, with everybody below (say) 10 only getting one entrant. I'll leave that analysis for another day. Celtic secured advancement to the playoff round with a draw and a win. That's very good! It's just a hair off a perfect result, and it ensures them of continuing to the group stages of either the Europa League or the Champions League, depending on what happens in the playoff round. I guess it was a bit closer than you'd like, with everything tied until injury time. Aberdeen got a draw out of the first leg, and looked to be going out on the away-goal tiebreaker until injury time of the second leg...when they conceded an own goal. So that's another 0.125 off the coefficient for the next 5 years, and Aberdeen bows out in the third round again. Still, the 3.5 they produced this year, is, when divided by 4, worth 0.875. If all of Scotland's non-Celtic teams could manage that, they'd be in good shape. Instead, the three non-Celtics totalled 7 points this year. I set 8 or 9 points as a target, so we're close, but not quite there. Looking ahead to next year, it'll be a crucial question of whether the Scottish Cup winner is a team who can produce more than the 1 point Hibs managed this year. Well, it's just Celtic now! Celtic is facing Hapoel Beer Sheeva, the Israeli champions. I think that's a good draw for Celtic. While Hapoel have surprised recently, I think you'd rather face an upset winner than a team with a long track record. It's pretty straightforward at this point. If Celtic advances to the Champions League group stage, they pick up a bonus of four points, which would be a good way towards achieving their "normal" contribution of 12. They can do that with anywhere from 1 to 2 points from wins or draws, so a win would put them at 7.5 to 8.5 and poised to pick up 2 points from each win and 1 point from each draw in the Champions League group stage. If they fail to advance, it'll be because they pick up no more than 1 point. While the 2 points for a win may be easier to get in the Europa League group stage, the long term financial hit from missing out on the 12 million plus Euros they'd get from the Champions League is a bigger deal. But look below! The four countries below all are doing better this year than Scotland, each has at least two teams left. Because of the four bonus points (equivalent to 1.0 in the coefficient) given for making the Champions League group stage, Israel is guaranteed to catch up with Scotland if Celtic loses to Hapoel -- even on two draws. So there's a good chance Scotland will finally catch or be caught -- or both. Stay tuned. We spent last week in Arizona visiting my parents, and I found two geocaches to go with the one Christina and I found in 2007. The first was in the parking lot outside a pool we visited in my parents' retirement community. 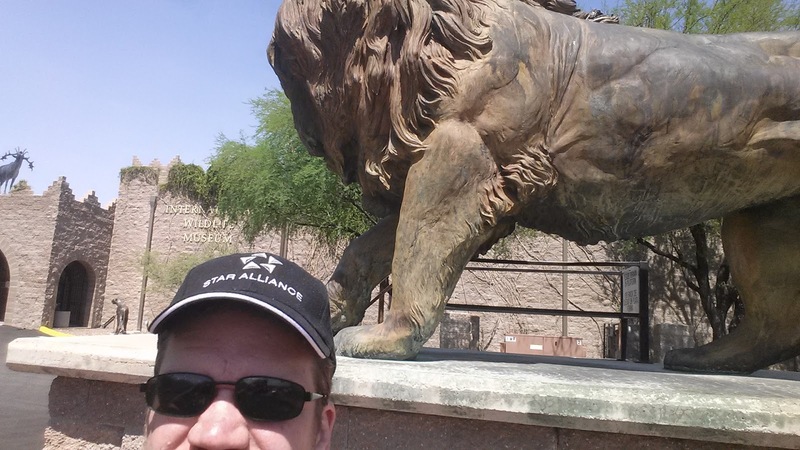 That gave me my first cache in Pinal County. The second was a virtual cache outside the surprisingly fun International Wildlife Museum. 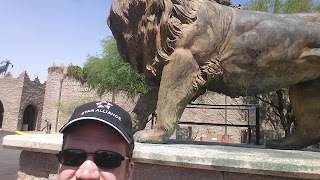 It pointed me towards a lion statue and required me to gather some information. Roar! These also represent the #8 and #10 highest elevations of any cache I've found. 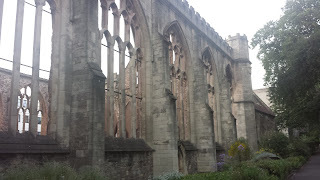 I had a nice week of geocaching in Bristol. I had ambitions of doing some "numbers caching" -- either breaking my record of 5 days in a row or 8 caches in a week. But to get the sixth day would require caching before my 6am taxi ride to the airport (or after midnight), and after 7 caches, I lost my pen and it was getting dark on my last evening, so...I guess I'll settle for seeing the UK pass Canada for #2 country in which I've cached. All of the caches I found in the UK were what's known as "urban micros". They are tiny caches, just big enough for a tiny piece of paper, and they're hidden in busy areas where you need to avoid being detected finding, signing and replacing the cache. Ordinarily these are not my favorite types of caches. But in Bristol they ended up being pretty neat, mainly because Bristol is a cool city, and they took me to some interesting places. Also, I think I'm finally getting better at finding these micros. The first cache I found, shortly after landing, was in a car park. But what a view! 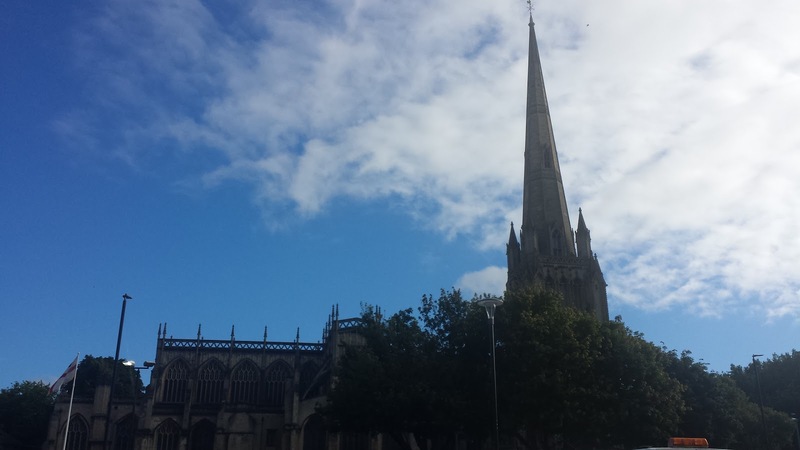 My hotel (and this car park) were right near St. Mary Redcliffe church, known to Elizabeth I as, "the fairest, goodliest, and most famous parish church in England." The hide was fairly clever -- it was inside a bike lock (sans bike) attached to a bike rack in the parking lot. The third day I found my first "Church Micro". 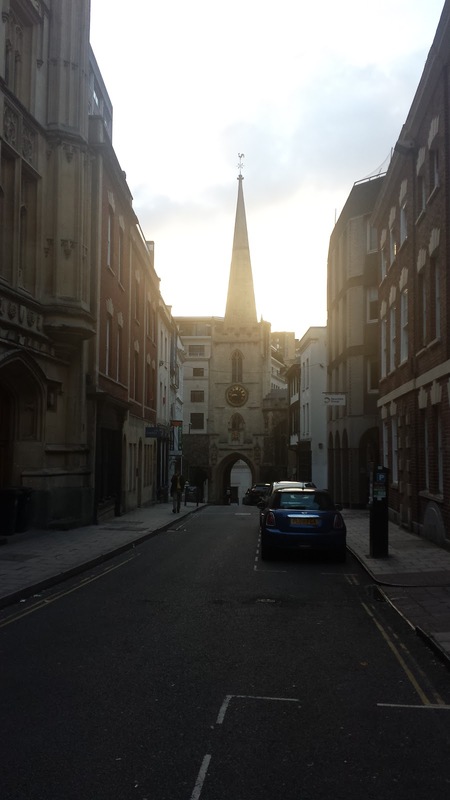 Hiding micro caches near churches is apparently a big thing in the UK. They've hidden over ten thousand of them. 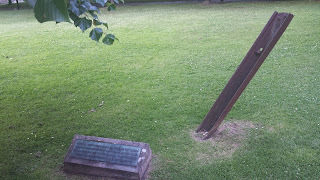 This one was in a church that was destroyed during the Blitz, which is now a park. 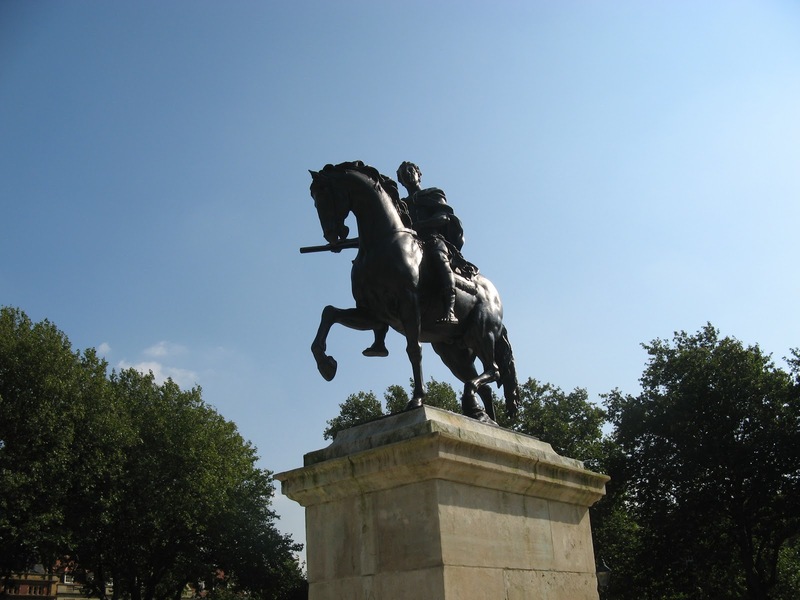 Bristol was experiencing a record heat wave when I was there, so the parks were full. I thought it was a bit odd for people to be out in the heat, but I realized they probably were better off in the park since most of the buildings weren't air-conditioned. Anyway, I had to come back four times before the bench the cache was attached to was clear of people. On Day 4, I found another blitz-related cache on my second try. This one brought me to a spot where a tram rail had been sent by an explosion into the courtyard of St. Mary Redcliffe. They left it there to remind people how close the church had come to destruction. Then it was another "Church Micro". This was actually pretty far down the street from the church in question, but it was a nice view. The final cache of Day 4 was in an open area near the water. Previous logs said it was hard to access during festivals and whatnot, but at around 9 at night it was mostly deserted -- but still light out! 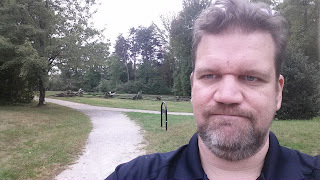 My final cache of the trip was in a park. For this one, I'll show you a little bit more about how urban micros work. This one was a fake screw on the underside of a bench. Once you know what to look for, it's pretty obvious. On some benches, this would be trickier, but this screw was fairly obviously not one that belongs to this type of bench. Anyway, geocaching got me out and walking, which helped (maybe) with the jet lag. 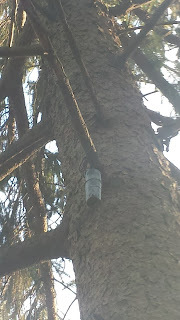 Because these types of caches are placed in high-traffic areas, a few of the more interesting ones had gone missing. I've marked them down for my next trip to Bristol.